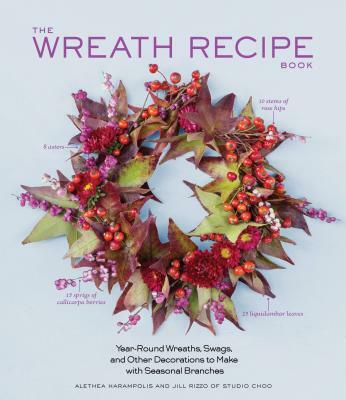 From the authors of the widely popular Flower Recipe Book,and in the same successful format, The Wreath Recipe Book provides 100 “recipes” to make with flowering and leafy branches. These aren’t just evergreens for Christmas—the book is organized seasonally, with dozens of projects to make throughout the year.In the spring, a cherry blossom bough gets a touch of whimsy with a colorful ribbon, and a tabletop is adorned with lilacs and olive branches. In the summer, a garland features sage with pomegranates and citrus-colored strawflowers. In the fall, wreaths are created with magnolias, rosemary, and plums, and gourds are used to create an unexpected garland. Winter highlights cedar, pine, and juniper, yielding unexpected table settings and new wreath shapes. There are detailed ingredient lists and hundreds of step-by-step photos as well as chapters covering basic techniques, sourcing, and care information. “[The book’s] 100 wreath, centerpiece and creative natural decoration ‘recipes’ . . . make me want to grab all of the branches and leaves I see on my walk home and turn them into something special for the table. . . . Alethea and Jill of Studio Choo decided to organize their book by season, with plenty of projects you can create in the spring and summer, not just in winter ‘holiday’ months."